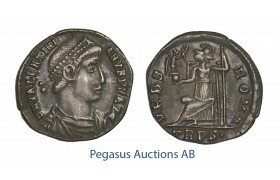 C57, Roman Empire, Valentinian I (364-375 AD) AR Siliqua (1.81g) Trier, VRBS ROMA, RSC 81e, Dark Ton..
ZE66, Western Roman Empire, Valentinian III (425-455 AD) AV Solidus (4.53g) Rome, 435 AD, Consular Type, NGC MS★ As struck! Very Rare! Possibly finest known! 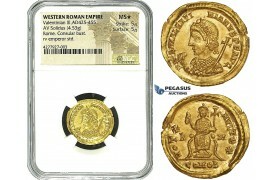 ZE66, Western Roman Empire, Valentinian III (425-455 AD) AV Solidus (4.53g) Rome, 435 AD, Consular T..